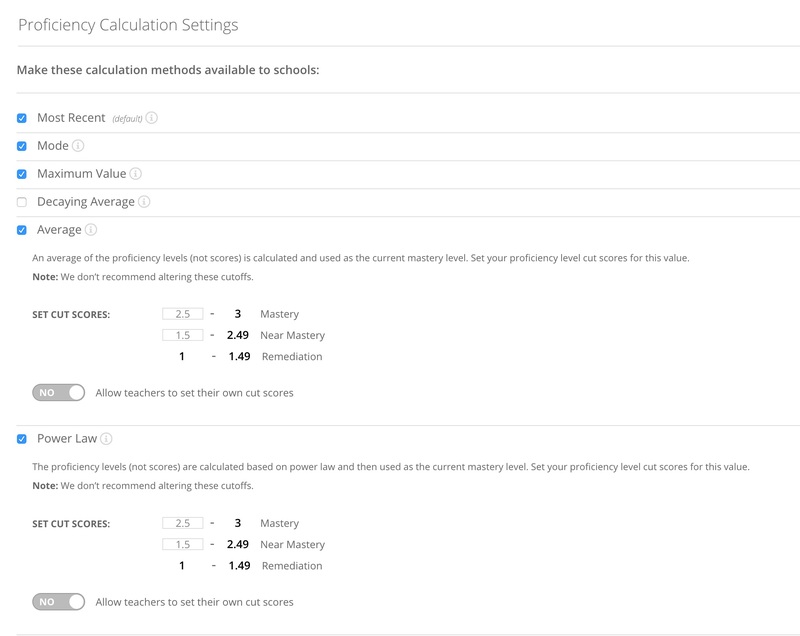 As an administrator, you can set the proficiency calculations for the trackers created in your school or district. You can choose to calculate proficiency or student mastery by most recent, mode, maximum value, decaying average, average, or power law. 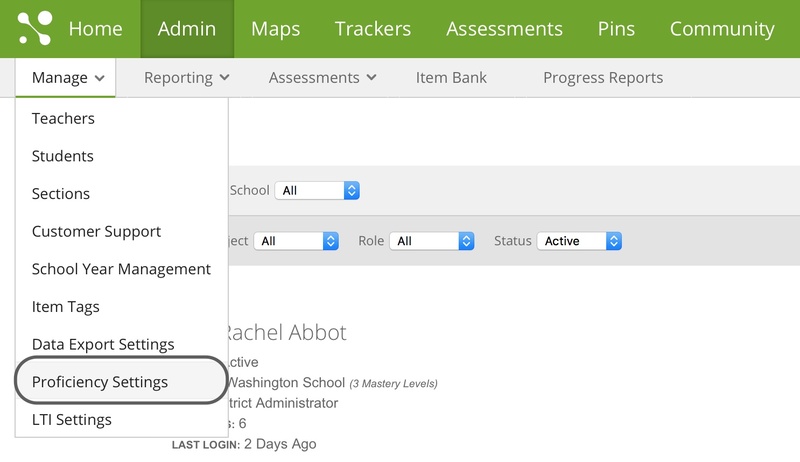 Click on Admin, hover over Manage, and click on Proficiency Settings. Check one or more of the boxes to make those calculation methods available to teachers in your district or school. Note: As a district administrator you can select the methods available to your district. As a school administrator you will only see those that the district selected, and you can limit those options for your school. The default is the Most Recent calculation. Click on the information symbol next to each method to find out more about that calculation. An administrator can set the cut scores for the range of each proficiency level for Decaying Average, Average, and Power Law. To allow teachers to set their own cut scores, click on the Yes/No button (this is not recommended). Set the Default Calculation for your district or school. When teachers create new trackers, they will automatically be set to this calculation method. Click on the Yes/No button to allow teachers to override the calculated status for individual students in their tracker. Click on Save Settings to save these settings for your district. Note: This will not affect the calculation methods for any of the trackers currently being used. If a tracker is using a calculation method that has been removed by the administrator, it will continue to use that method until the teacher changes it. It can't be changed back to the method that was removed.